Top left photo: enjoying my (what my friend Matt named) the “personal protection cactus pillow.” My friend Emily handed me the the cactus she made for me during an event at Coffee Girl and I spent the rest of the evening walking around unconsciously hugging it while talking to random people. I don’t think anyone can be nervous when you’re hugging a huge cactus pillow. I actually felt a lot more willing to talk to strangers with my security cactus in my arms! Emily also showed me how to drape your arms around it and droop your head down and let the cactus support you! 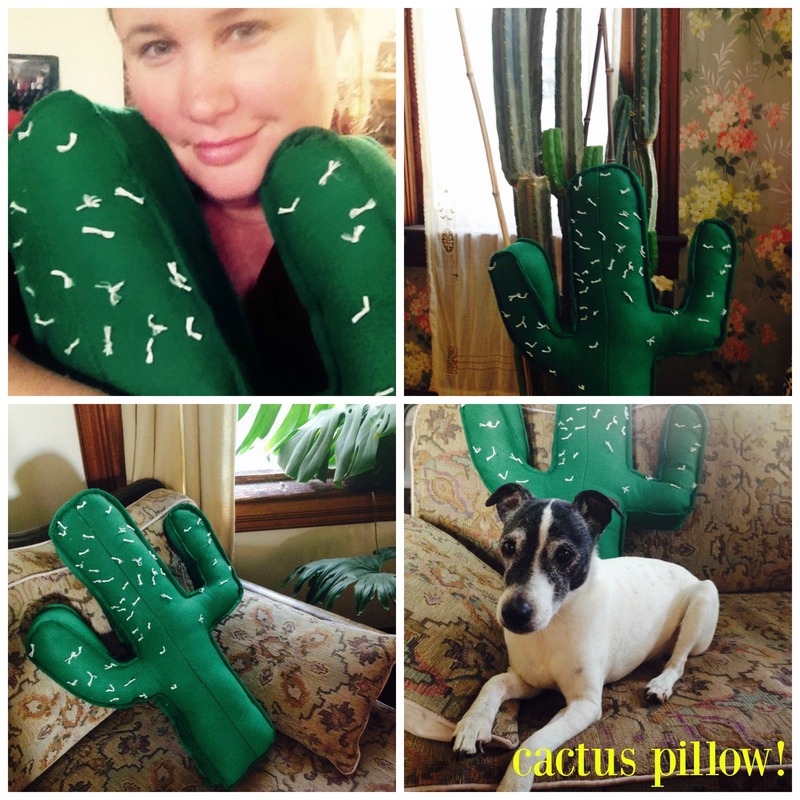 Top right photo: my cactus pillow making friends with our real cactus!! Bottom left photo: Our new cactus pillow settling in on our couch, waiting to greet guests and begging for the question “so what’s up with this cactus pillow,” thus breaking the ice with guests–thank you cactus pillow. Bottom right photo: Oscar bonding with the new cactus pillow. They will be spending quite a bit of time together when I’m at work. One of the cool things I’ve wanted to do ever since starting a small craft business, was to trade with other makers. When Emily expressed interest in my coloring book, I saw the cool stuff she was making and instantly thought “why don’t we trade!” She was game and it was super fun to see this video of Emily making the pillow! Yay for trades. Thank you Emily!